Heterotropics and the Research Center for Material Culture are pleased to invite you to the symposium Tropical Dissonance: Decolonizing knowledge through ethnographic archives. The symposium is organized by the research collective KUNCI Cultural Studies Center (Yogyakarta, Indonesia) as a concluding event of their residency project at the Tropenmuseum. Tropical Dissonance brings together scholars, curators and artists from a wide range of practices to explore the intersections between decolonial research, artistic practices and alternative knowledge production. Focusing on the use of ethnographic objects, or more broadly colonial archives in imperial and post imperial knowledge formation, we want to explore the multiple, often hidden, fractured legacies of this colonial past in the present and its impact on how we understand the world today. 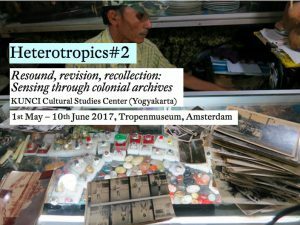 The Research Center for Material Culture in collaboration with the research platform Heterotropics, invited KUNCI Cultural Studies Center to be Researchers in Residence at the Tropenmuseum for the period May – June 2017. Heterotropics is curated by Sara Giannini in collaboration with TAAK. 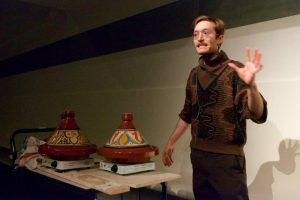 KUNCI’s residency project has been done with the kind support of the Research Center for Material Culture, Amsterdamse Fonds voor de Kunst, and Prins Bernhard Cultuurfonds.